GeoShield Ltd were proud to take part in the Ground Gas 2018 event which is focused on ground gas assessment, verification, validation and protection. Recent Government figures showed that there was a 15 per cent rise in the number of new houses built over the year and that since 2010 1.1 million homes have been built. The key to this development is the Government’s commitment to bring brownfield land back to use. Representatives of GeoShield Ltd are proud to be taking part in the Ground Gas 2018 event in London on March 1st 2018. The event hosted by Brownfield Briefing and the Environment Analyst is aiming to bring together regulators, consultants, remediation contractors and other industry experts with a specific focus on ground gas assessment, verification, validation and protection. GeoShield Limited provide independent testing and verification for ground gas protection systems. Spanning the whole of the UK our trained verification officers are actively validating and verifying from the English Channel to beyond the highlands of Scotland. GeoShield provide a 100% independent client friendly validation and verification service which includes pre-construction verification planning, comprehensive monitoring and reporting and a comprehensive handover documentation pack, all are covered by GeoShield Professional Indemnity Insurance. As each project is unique in terms of size, construction type, hazardous gas characteristic and application team experience a bespoke risk based approach is taken by GeoShield to form a gas remediation strategy specifically suited to your contract exact needs. 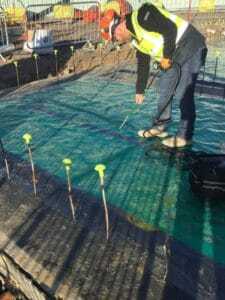 GeoShield perform all testing procedures as required under CIRIA C735, 2014 and along with our comprehensive reporting protocol we feel we provide a service that’s unique in the industry. (BS 8485: 2015 replaced the 2007 version) and CIRIA 735 (created in 2014) with the result that an increasing number of projects are at risk of not meeting the current requirements. BS8485:2015 now relies upon a point scoring system for new constructions. GeoShield offer CPD registered training seminars to the industry to assist in meeting these standards. GeoShield are members of the European Radon Association, the UK Radon Association, the Radon Council of Great Britain, the Property Care Association and Concrete Society, are associate members of British Geomembrane Association and a leading force within the British Verification Council.